There are children who have never heard of, or seen much of the wildlife Jan Latta showcases. Her photography and research focuses on educating children about endangered species and bringing the nature world to life. Sleepy the Sloth, another of Jan Latta’s True to Life Books, took her five years of research to create while encountering lots of obstacles to overcome. She finally had to travel to the Jaguar Rescue Centre in Costa Rica to take her photographs of the sloth to fit in with the book she already written and designed. Sleepy is a two-toed sloth. There are also three-toed sloths. His uniqueness lies in the fact that he lives upside-down. His hair grows from his stomach to cover his back. He is very hairy and smiles all the time. He has the most beautiful face that you can’t help but adore. Just as well as he’s always hanging around! Sleepy is the narrator. 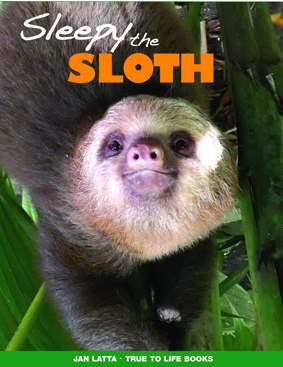 He introduces himself, his habitat, eating habits and lots of facts about sloths that you simply won’t believe. He climbs down his tree once a week to fertilize the ground for the sloth moths that make their home in his hair, to lay their eggs in. 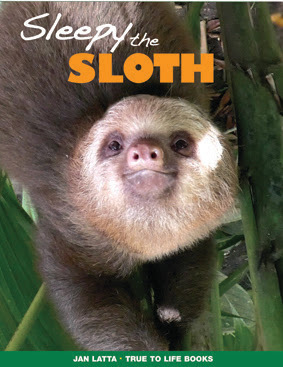 Accompanying Sleepy’s narrative, are stunning close-up photographs of the sloth’s features, toes, how he curls into a ball to sleep and without me spoiling it for readers by revealing too much, lots of other exciting and interesting information. At the end of the book there is a page of sloth facts, another page of Did You Know? followed by a discussion on how the book was created. You will come across a maze to help the sloth moth find its way back into Sleepy’s hair. There are lots of activities for kids to try, an Animal Map, a sloth to colour in, and a list of interesting websites to discover. For more insight behind the making of this book and some truly gorgeous baby sloth photos, read Jan Latta's guest post, here. Is this book available in the US? Not directly, but feel free to contact the author (Jan Latta) and request a copy.